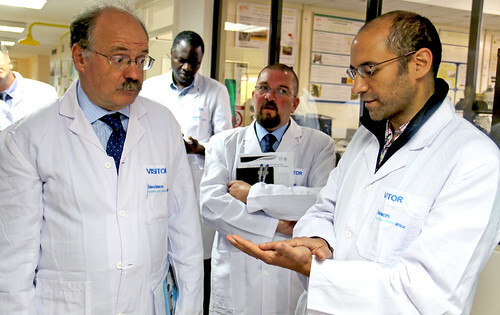 A visit by the United Kingdom Government's Chief Scientific Adviser, Professor Sir Mark Walport to the International Livestock Research Institute (ILRI) in Nairobi, Kenya on 15 July 2015 highlighted how UK’s investment in research in Africa is spurring the emergence of strategic partnerships between research institutions in UK and Africa. 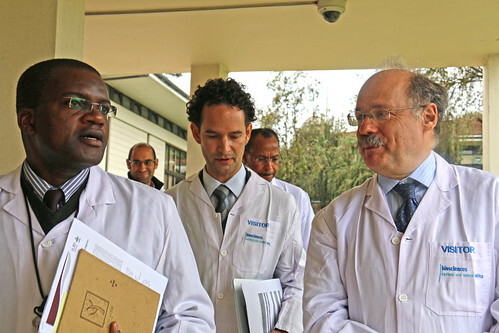 During his visit to ILRI, Sir Mark toured the state-of-the-art Biosciences eastern and central Africa-ILRI (BecA-ILRI) Hub laboratories, a facility that provides access to and hosts research by African national scientists and their partners working to tackle key challenges to food and nutritional security on the continent. Sir Walport learned how the UK Department for International Development (DFID) and other donors including the Bill & Melinda Gates Foundation, Sweden, Australia (DFAT) and the Syngenta Foundation for Sustainable Agriculture (SFSA) are jointly supporting a program that brings over 50 African national scientists a year to the BecA-ILRI Hub to conduct cutting edge, appropriate research aimed at addressing key constraints to African food and nutritional security, from BecA-ILRI Hub capacity building scientist Wellington Ekaya. To demonstrate the impact that the ABCF program is already having on national programs’ research, Barberine Assongo from the University of Dschang in Cameroon briefed Sir Walport on the research she is conducting as an ABCF fellow to control the economically significant cattle disease, East coast fever (ECF). This tick borne disease is responsible for the deaths of over one million cattle each year valued at over $300 million in Sub Saharan Africa. Although a vaccine based on the whole live parasite is available, its need for cold storage and delivery has hampered widespread use in endemic areas. There are also concerns about spreading the disease to new areas by establishing a ‘carrier’ state in vaccinated animals. Through her research, Barberine hopes to contribute to the development of a vaccine based on parts of the parasite which will not require cold-chain storage and delivery. Among the scientists Sir Walport met during his visit to ILRI were researchers Jagger Harvey, Josiah Mutuku (BecA-ILRI Hub) and Samuel Mutiga (University of Arkansas/BecA-ILRI Hub visiting researcher) who are working on components of bean and rice improvement projects supported by the Sustainable Crop Production Research for International Development (SCPRID) initiative, funded by UK’s Biotechnology and Biological Sciences Research Council (BBSRC), the UK Department for International Development (DFID) and (through a grant awarded to BBSRC) the Bill & Melinda Gates Foundation (BMGF). The SCPRID project focused on beans is working to manipulate natural dynamics in bean-virus-aphid interactions for the benefit of over 200 million people in sub-Saharan Africa who depend on the common bean for nutrition and income. A team of scientists from University of Cambridge and Rothamsted Research (UK); the BecA-ILRI Hub; and the International Center for Tropical Agriculture (CIAT)-Pan African Bean Research Alliance (PABRA) are exploring new ways of controlling bean virus diseases by altering the feeding patterns and behaviour of aphids through this initiative. In the SCPRID rice project being partly conducted at the BecA-ILRI Hub, researchers from University of Exeter, the Ohio State University, the University of Arkansas, the BecA-ILRI Hub, Kenya Agriculture and Livestock Research Organization (KALRO), and the Institut de l’Environnement et de Recherches Agricoles (INERA), Burkina Faso are using genomics to develop durable blast resistance in rice in Africa. The production of rice which has recently become the staple food for a large population in Africa is threatened by rice blast, a fungal disease which causes a global loss of amounts large enough to feed around 60 million people each year. The project has collected and tested blast fungal isolates from East and West Africa against a panel of potentially resistant rice lines, and is devising the breeding strategies for deployment in each of the two regions. 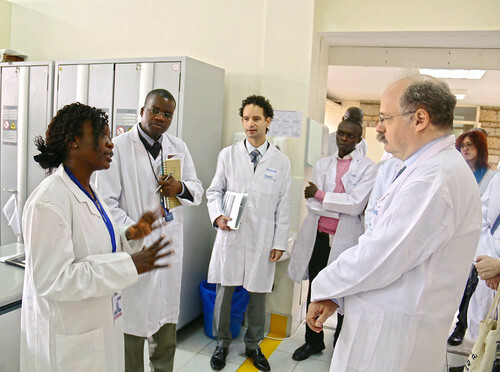 Through strategic collaborations with advanced research institutions in the UK, the BecA-ILRI Hub has set the stage for sub-regional organizations, African universities and research institutions within the BecA region; western and southern Africa and beyond to benefit from relevant high-end basic research. A Memorandum of Understanding between the BecA-ILRI Hub and the John Innes Centre (JIC), UK, has brought one of the leading plant science institutes in the world as direct partners in the research for development pipeline for African agricultural improvement. The JIC Director of International Strategy and Liaison, Christopher Darby and JIC molecular wheat breeder Cristobal Uauy who were in Nairobi to lead a selection panel for a JIC Science for Africa PhD studentship in yellow wheat rust research, expounded on the role of the alliance in significantly augmenting the BecA-ILRI Hub’s ability to support NARS research to Sir Walport. Two key collaborations under the BecA-JIC alliance on crop improvement received special attention. Alemu Abate, a grass pea breeder from Askum University in Ethiopia who is currently an ABCF fellow and Peter Emmrich, a JIC grass pea researcher currently at the BecA-ILRI Hub to provide technical support, highlighted the significance of Abate’s project to produce safer lines of the drought-hardy crop that can survive under harsh conditions faced by millions of subsistence farmers, but which is associated with a plant toxin that causes paralysis. Doreen Mutoni, a bean breeder from the Rwanda Agricultural Board (RAB) and ABCF fellow, Tilly Eldridge, a JIC scientist based at the BecA-ILRI Hub and Cristobal Uauy a JIC molecular wheat breeder, highlighted how Mutoni and the RAB program are being supported in applying genomics to introduce molecular breeding to an already strong conventional breeding program. Eldridge’s secondment at the BecA-ILRI Hub is funded by The John Innes Foundation and a BMGF supplementary grant to the Engineering Symbiosis for Africa (ENSA) project. Over the next year, Eldridge and other JIC researchers will be supporting capacity building activities at the BecA-ILRI Hub. The BecA-ILRI Hub’s capacity to connect NARS scientists to global research partners in an aggressive effort towards a food and nutritionally secure future continues to be strengthened by a four year Program Support Grant of USD 12.5 million being funded jointly by DFID and BMGF.